As of January 2014, The European Physical Journal C – Particles and Fields will be published as full open access journal funded by SCOAP3. One of the leading journals in the field, EPJ C was selected to participate in this initiative - lead by CERN with the support of partners in 24 countries - which will make a vast fraction of scientific articles in the field of High-Energy Physics open access at no cost for any author. Moreover authors will retain copyright and creative commons licenses will enable wide re-use of the published material. Complicated statistical behaviour observed in complex systems such as early universe can often be understood if it is broken down into simpler ones. Two physicists, Petr Jizba (currently affiliated with the Czech Technical University in Prague), and Fabio Scardigli (now working at Kyoto University in Japan), have just published results in EPJ C pertaining to theoretical predictions of such cosmological systems’ dynamics. The origin of ultra-high-energy cosmic rays, with energies around the GZK cutoff, remains an unsolved mystery. In the present letter a novel and intriguing explanation is suggested that links far-reaching fundamental aspects of F(R) modified theories to an efficient production of highly energetic cosmic rays during the recent history of the Universe. At the core of this work lies the proof that in cosmological and astrophysical systems with rising energy densities, the F(R) modified theories of gravity exhibit powerful oscillations of the curvature scalar R, with an amplitude much larger than the standard value of curvature predicted by the General Relativity. These oscillations are strongly anharmonic, with frequencies that can be as large as billions of GeV. This striking and rather unexpected oscillatory behavior of R lends support to the idea that ultra-high energy cosmic rays can be generated by such curvature oscillations at the appropriate cosmological redshifts. EPJ C - Neutrons escaping to a parallel world? An anomaly in the behaviour of ordinary particles may point to the existence of mirror particles that could be candidates for dark matter responsible for the missing mass of the universe. In a paper recently published in EPJC, researchers hypothesised the existence of mirror particles to explain the anomalous loss of neutrons observed experimentally. The existence of such mirror matter had been suggested in various scientific contexts some time ago, including the search for suitable dark matter candidates. 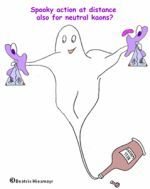 EPJ C - "Spooky action at distance" in particle physics?! Physicists have developed the first conclusive test to better understand high-energy particles correlations. 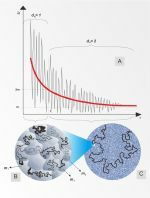 Researchers have devised a proposal for the first conclusive experimental test of a phenomenon known as "Bell’s nonlocality". This test is designed to reveal correlations that are stronger than any classical correlations, and do so between high-energy particles that do not consist of ordinary matter and light. These results are relevant to the so-called "CP violation" principle, which is used to explain the dominance of matter over antimatter. 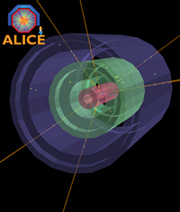 These findings by Beatrix Hiesmayr, a theoretical physicist at the University of Vienna, and her colleagues, a team of quantum information theory specialists, particle physicists and nuclear physicists, have been published in EPJC. The physics paper with the highest percentage increase in citations so far in 2010, as determined by ScienceWatch.com, is `Parton distributions for the LHC' by A Martin et al. Eur.Phys.J.C63:189-285, 2009 This article has meanwhile been cited over 200 times, according to the reference database for high-energy physics, SPIRES. The paper was already selected as highlighted article by the editorial board of EPJ C, featuring on the cover of the September 2009 issue of this journal.